Creative Cooking Saves Money: How are you doing? 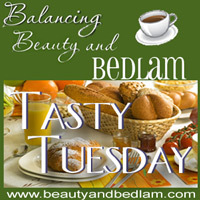 Welcome Tasty Tuesday friends to my No Spend, Clear Out, Eat from my Pantry and Garden Challenge Update. If you missed the introduction for it, find out about the Challenge here. I have gone NINE days without buying anything from the grocery store, and it has been a freeing feeling. (We already had two gallons of milk on hand.) By stretching myself to cook creatively with what I have on hand, we have eaten better and more healthy this week than in a long time, as well as saved huge amounts of money. Since the first thing to go in a Challenge like this are the “junk food” and “quick type” of food items, I’ve had to retrain the kids that there IS a lot of food available, it just may take a minute or two to access the options. 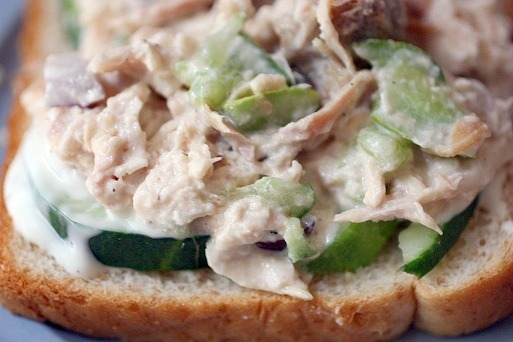 From the first picture above, I can tell you that we have had TONS of fresh chicken salad variations, all with lots of cucumbers mixed in, sometimes with zucchini and squash. I had mayo stockpiled, so it’s been great to be using something else that I have an overabundance of on hand, as well as ranch dressing. The first day I made the veggie stuffed chicken salad, our youngest claimed, “I do not want to eat that.” Yesterday, I overheard her telling my nephews how her mom has been making the best sandwiches, and she ASKED for one yesterday. As you can see, I’ve had amazing success with our garden. After five years of it dying by this time, it’s a joy to have unlimited cukes and squash at our disposal. We eat at a minimum of ten cucumbers a day, and my teen guys have completely come on board with reaching for them when they are hungry. I try to have them sliced and out all day long. When the batch has been eaten, I slice another one. They have become quite the connoisseurs in the world of gourmet cucumber making since many mornings I come down to a plethora of dipping trays they have created with oil, seasonings, dressings and their newest adventure yesterday was cucumbers dipped in Siracha. If you follow my Facebook Fan Page, you can read about that newest addition to our home and get lots of ideas for it. I’ve been cooking creatively and using up some of the slightly stale snack foods as breading. The first picture of the chicken, I used crushed Pepperidge Farm Goldfish as my coating. Here I did a slight variation to this Paula Dean Squash Casserole by adding crushed Cheese-It Crackers and then pretzels as a coating. The kids declared it “interesting,” but I will not add the pretzels into the mixture. Maybe as a topping at the end to give it a crunch would be good. I mixed it in and they got soggy. It was a yucky texture thing, but it still tasted fine. 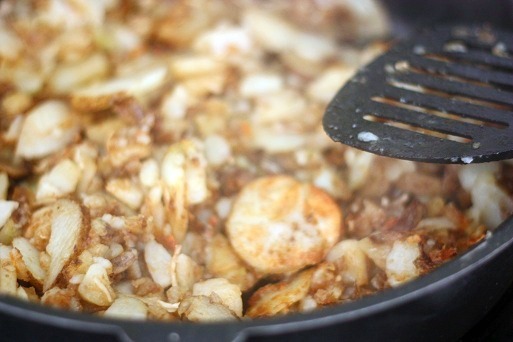 We finished up our ten pound bag of potatoes with a yummy baked potato bar one evening and then I used the left over baked potatoes for breakfast skillets the next day. Our fruit is slim pickings now, but because we had TWO watermelons left over from our July 3rd party, I did watermelon smoothies for the first time. 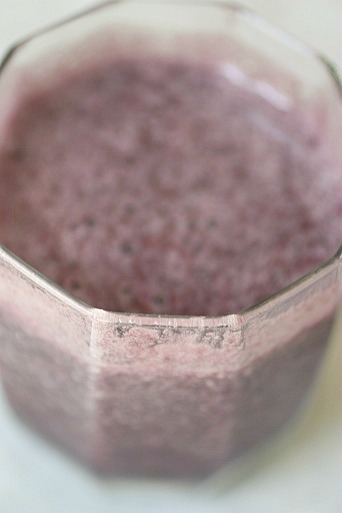 Yes, I know it looks black because I mixed in some of home grown blackberries, along with bananas for sweetener. My husband is on board for one more week of absolutely no spending on groceries. The last few days have been a bit more challenging, so he agrees, why not REALLY challenge ourselves. We’ve been eating well so far, it’s just that it’s now MY responsibility to dig down and get really creative. We have a LOT more chicken, so it should not be terribly difficult. I’ll let you know how it goes. Please share how your challenge has been going. I’m loving this challenge and hope you are too. If you aren’t doing the challenge, are you eating differently this summer now that produce is at its peak? And of course, I am not in this alone. Check in with my other fun foodies friends to see how their challenge is going. Now let’s see what you all are cooking up for Tasty Tuesday. gosh everything looks yummy. My daughter is so easy to feed but my son who is 15 is so picky. I don’t feel like I’m making much progress so far on this Pantry Challenge, even though I’ve not been to the store since the 1st of July (wow, that’s 12 days!) … but of course, there is a trip coming up this week …Doing inventory has been difficult to get focused on, have only done 2 areas which are the majority of canned items … but still so much to go through. Uggg. All those cukes would make some great pickles! I have an easy microwave recipe that allows you to make just a jar or two at a time, and it’s easy enough for my kids to make! Do you preserve by canning or freezing, or do you just eat your produce fresh? I would love that recipe. I have NOT done pickles yet, and plan on it this year. This is the first year that my cuke plants have had enough because with us eating a about ten a day , there typically haven’t been enough to pickle. I’d love to try some this year, though. @Jen, I think if you just click my name in this thread I linked it so you can go straight to the recipe. I hope it works! If you make them let me know how you like them. We’ve gone through two pint jars already! omg this is so awesome – we do have some dietary needs to consider but i am so on board with this – thanks for the great idea! I’ve been to the store for our staples, but I have been cooking from the garden, pantry and freezer. Everything looks great.. We’ve been eating from the freezer & frig for a while now too. Every once in a while we have to.. Last night I took left over bacon wrapped sirloin steaks and cut them into small pieces, and put them in a beef gravy I made with bouillon, water, & corn starch. I served that over noodles with a generous side salad. Should have/could have put mushrooms in it but I didnt think about it until it was too late. Either way, it was tasty enough & my 2 guys ate their fill..
Nine days without visiting the grocery store is amazing! Well done! I’m really inspired by your post. My garden is doing okay, but the British weather has wrecked havoc with my zucchini – they are teeny tiny and just won’t grow! I’ve linked up a great store cupboard dip actually, so it kind of fits in with your theme this week. And I’m going to see what I can do about emptying my pantry using your great ideas! Having to back link before posting makes a lot of extra work. Can you fix that? Jill – the link does not have to be to the direct post. I made it so that it can just be a link to my blog, so it shouldn’t make extra work. Hope that helps. I love your tips. We’re huge fans of NO WASTE. It’s amazing how God provides more if we resourceful with what He gives us. You’re doing a super job. Hi, this is my first time here! We’re all about using up everything we have available — garden included. Thanks for hosting, and looking forward to reading all the great recipes. A very interesting challenge! I will have to give it a try sometime…maybe when we start getting a harvest from our garden. Hi, Jen. Thanks for letting me link up each week, and I ALWAYS find something new and yummy to try. Last week, I made a chicken salad with cucumbers, and instead of mayo I used Poppyseed Dressing. It was SO good. If you want the recipe, I”ll send it to you. 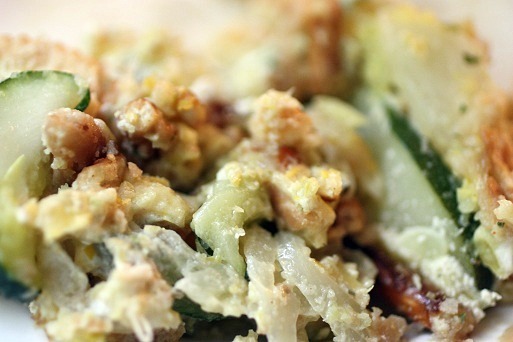 I loved it because I could use a lower fat version of dressing, and I mayo isn’t always my go to choice. My fiance and I are currently doing this, with a big focus on our freezer. Sadly we live in an apt., and only have room for two small tomato plants, so we do need to hit up the store for our fresh produce. But so far that is all we are buying (and one package of frozen waffles – my guilty pleasure). It feels great to use up the half empty bottles and packages! I was so inspired to cut way down on our food spending this month! I made lists of everything we had and was so ready to get creative. Then I went to our garage freezer to pull out our stockpile of meat only to discover that someone little had left the freezer door open after his quest for popsicles! That baby was full! I am thankful, though that it was not hundreds of dollars lost since I had gotten everything on sale. I am thankful too, that God is in control and has a plan because He knew that this happened. Although my husband said it would’ve been nice if He had mentioned it to me! oh Kristen – I FEEL your pain. This happened to me just a little bit again. Were you able to save any of it? Can you do some quick bulk meat cooking? @Jen, Thankfully, some pre-cooked meat was salvageable. Everything else was BROWN and LEAKY!!! A couple of frozen boxed items seemed okay, but they had red drippings on them that I couldn’t determine if it was melted popsicle or blood from meat (yucky to even type that!)! Oh well, off to restock a little if I can find some good meat markdowns, otherwise we are temporary vegetarians! It’s awesome and my fave way to use those cukes up! I think you’re doing a great job! I really need to do this again. We’re well stocked with meat, but I’m sure there are other things around that I need to use up. Need to do some inventory!